Recent decades have seen increases of overseas R&D operations, first in US multinational enterprises (MNEs) and later in those from Japan. Substantial parts of this growth have taken the form of laboratories, controlled by these MNEs, located in Europe.1 Furthermore European MNEs have a strongly-established commitment to the performance of R & D in Europe outside of their home country. This chapter argues that this growth of MNE R&D not only serves the obvious fundamental purpose of enhancing a firm’s competitiveness in the European market, but does so in a way that should be seen as also an integral part of the firm’s global strategy for sustained long-term development. 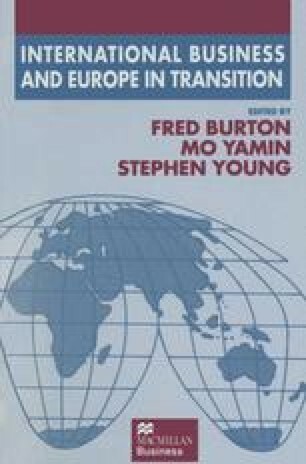 In fact an argument of the chapter is that Europe can be seen as a middle level in the strategy of these firms, being perceived as a key region in the formulation of global strategy but also acknowledging the persistence of national needs and characteristics as potentially relevant to the effective implementation of European policies.